We first saw it sitting on the deck railing. The pattern on its back was as though made of hand-set coarse grains of sand … simply beautiful. Being an asymmetrical arrangement of colors … more tones than colors … was what caught my eye immediately. 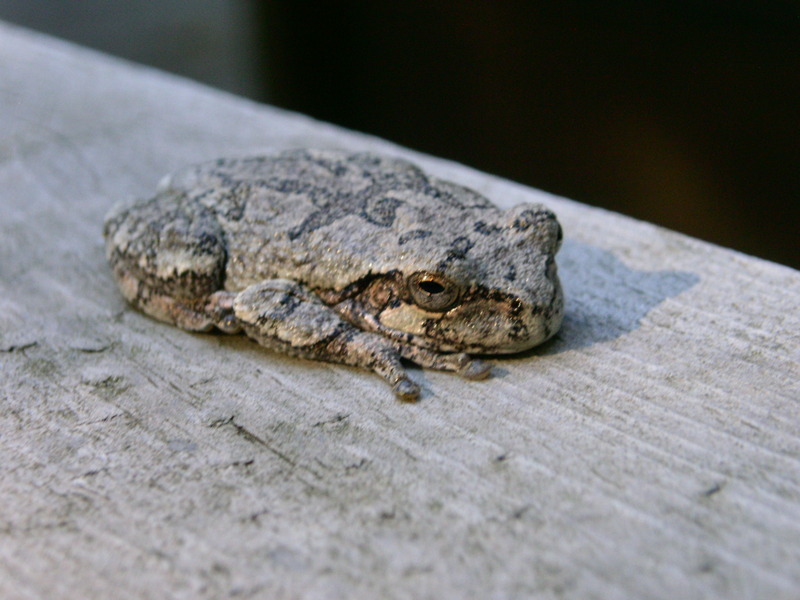 It is a grey tree frog. The frog posed for several pictures before I moved it to a safer place on the rail and away from the steps. By the next morning, the frog was gone. It was mid-August. 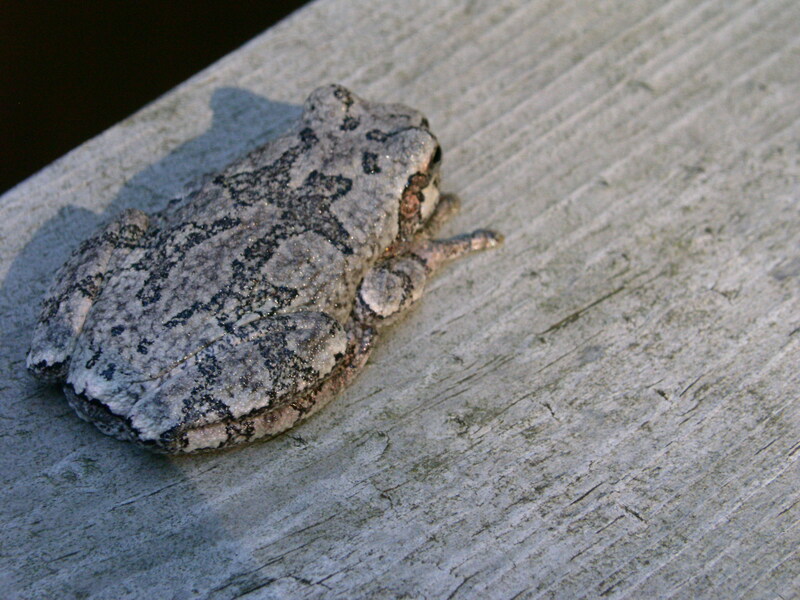 When we returned to the lake in late September, the frog was sitting on the wood plank approach to the deck steps. Half of its body was obscured by a fern frond. Not a good idea from a survival standpoint. I guess it figured being the same color as the wood and under a leaf provided a margin of safety. But it also rendered it nearly invisible and easily stepped on. So, I put it on the same rail of the deck which it seemed to enjoy in August. That night it hadn’t moved, and its eyes were wide open and very watchful. I gently placed it under the deck where it would be out of the way. A couple of days later it was on a stepping stone in the yard, blending in perfectly. Its presence slipped my mind. Later in the day, blood was observed all over the side of its face, but it didn’t appear it had been stepped on. I picked it up, and it was very lively. It sprang from my hand when I got him to the edge of the woods. The weather was getting pretty cold by the time we left, and will reach into the minus 20s during the winter. Non-aquatic frogs, according to Bernd Heinrich in Winter World, often burrow down several feet to stay below the frost line. Some can also withstand being frozen to as low as -8 C and will merely get under leaves or snow to survive the winter. In any event, this particular frog was making it through the winter long before I ever saw it. Maybe it will return next year and resume its perilous visits to our yard. This entry was posted on October 13, 2011 at 10:49 am and is filed under Nature. You can follow any responses to this entry through the RSS 2.0 feed. You can leave a response, or trackback from your own site.